Welcome to Aspira International Summer School! Collect a lot of wonderful memories through studying about hospitality management and gastronomy. Master Mediterranean cuisine through practical workshops in a top-notch culinary studio and learn about Croatian culture, language and heritage. Experience Dalmatia and the Mediterranean region through field trips and organized visits. Make your summer 2019 unforgettable! 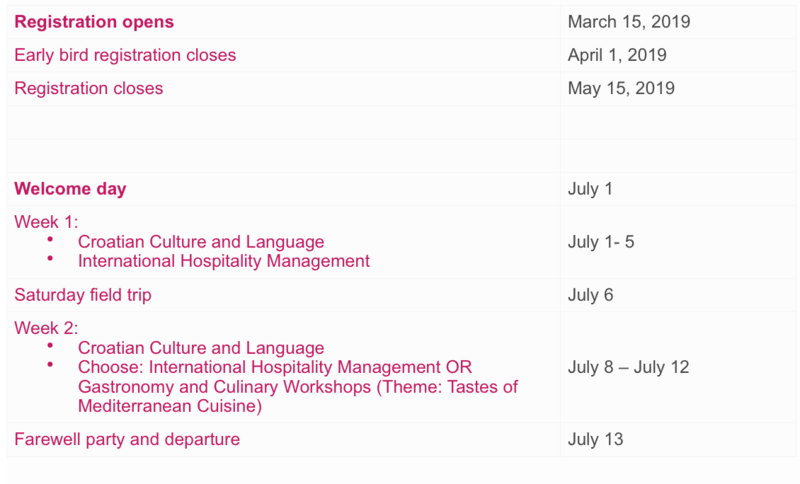 Join us at the best summer hospitality, gastronomy and culture program in Europe! Accommodation is NOT INCLUDED in the tuition fee. The price for accommodation during a two week Summer School course is approximately 400-500 EUR if you stay at hostels. All spaces facilitate student life to the fullest and allow students to live a unique experience. Most hostels are modern & urban designed, located in the heart of Split. If you do not wish to stay in the hostel, you can alternatively look for private accommodation on your own using Booking.com or Airbnb. The school will be happy to assist you in the process of finding a flat by providing helpful links to various rental agencies that offer short term apartment rental. The School holds no responsibility in finding and/or arranging private accommodation. This is solely up to you. Early bird registration closes. Final Registration Deadline: May 15, 2019.